Forget about St. Patrick's Day, it's National Quilting Day! Oh I jest...just pulling your leg about forgetting about St. Patrick's Day - cause I'm 1/2 Irish! I'll be attending a St. Patrick's Day Block Party tonight and am looking forward to a great time with my wonderful neighbors. I need to bring an appetizer so I think I'll make a crab/cheese dip my mother used to make - it's served hot so I'll bring it in my little fondue pot. Yesterday I recorded my latest podcast (Episode 23) about Two Color Quilts, a topic suggested to me by my fellow quilting podcaster, Daisy of Lazy Daisy Quilts. Thank you Daisy! 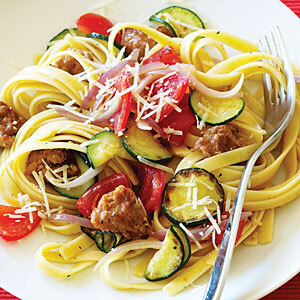 I talked about making Italian Sausage and zucchini pasta from Sunset Magazine. You can find the recipe here. Very light and super flavorful. Easily adapted with more vegetables or a different pasta. The T-Shirt Quilt and I are taking a little break from each other. Although I did not speak of that in the podcast, I looked at it last night as I was taking it off my bed and decided that I should be working on fun things right now. I'll be back at work on the Sew Happy Quilt today in honor of National Quilting Day. Go check out Sandy's blog at Quilting...for the rest of us as she is hosting a Giveaway in honor of today's festivities. Here is the HGTV link to the Simply Quilts segment hosted by Alex Anderson called Two-Color Quilt Show. It's a six minute segment about an exhibit at the San Jose Museum of Quilts and Textiles called Take 2: Quilts in Two Colors. Check it out here. 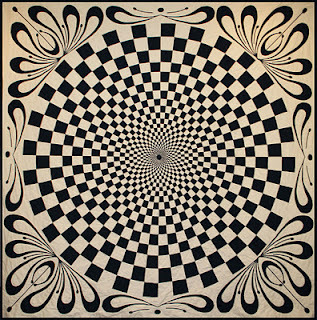 Here's a link to a very modern black & white quilt called Vortex in Variation by Nora Ronningen. Her mother blogged at Collector With A Needle about the experience of having her daughter's quilt shown at the International Quilt Market in Houston last year. 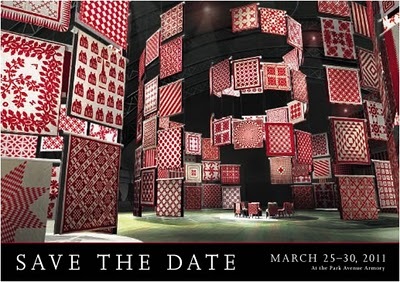 Here is the PR flyer for the Infinite Variety: Three Centuries of Red and White Quilts show that was hosted by the American Folk Art Museum in March of 2011. They even have a free iPhone App to view all 651 Red & White Quilts in the exhibit. Check it out here. Martha Stewart blogged about the Infinite Variety show here and has numerous photos. 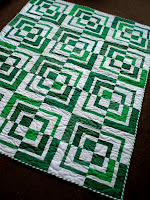 Here is the Green & White Modified Bento Box quilt which is made by Anya who blogs at Hills Creek Quilter. I just love how she used different shades of green. She blogged about it here. Take care, stay safe and have fun. oh wow - what a very full post - will try to listen to the podcast this weekend. I had no idea it was National Quilting Day! hmmm....anyway, thanks for the recipes and great links to the 2-color quilts. LOVE that red display, and that green quilt is so awesome! Happy National Quilting Day. I took a hand quilting class in honor of it. Enjoy your festivities. One of the interesting things about podcasts is listening to a quilt description and then seeing the actual quilt picture later. How does one describe a quilt like Vortex? I hope you got to meet with Kelly V at the show; I have a quilting buddy named Kelly and we are hoping to go to a show this weekend. I got the great treat of meeting with Frances last week, and it was a hoot. I love your podcast and blog. Thank you for a great podcast Susan. I love two color quilts but have never made one. If I do, I know it would be a scrappy quilt - definitely a future project. You and your teens are doing so well - and one soon to be driving. Oi Vey - didn't exactly love that part of mothering! I so wished I hadn't been sick and missed the Glendale show. I have always felt for a mid-size show they do a wonderful job. Maybe a meet-up at IQF Long Beach would be a good idea? I wonder who else would be on the West Coast in July? Thanks for the podcast, I enjoyed listening to it tonight while hand stitching a binding on a mini quilt. I made this pasta tonight and I loved it but no one else did. My husband thought it was okay but said no onions next time. The kids all ate their token tastes of veggies and left the rest.